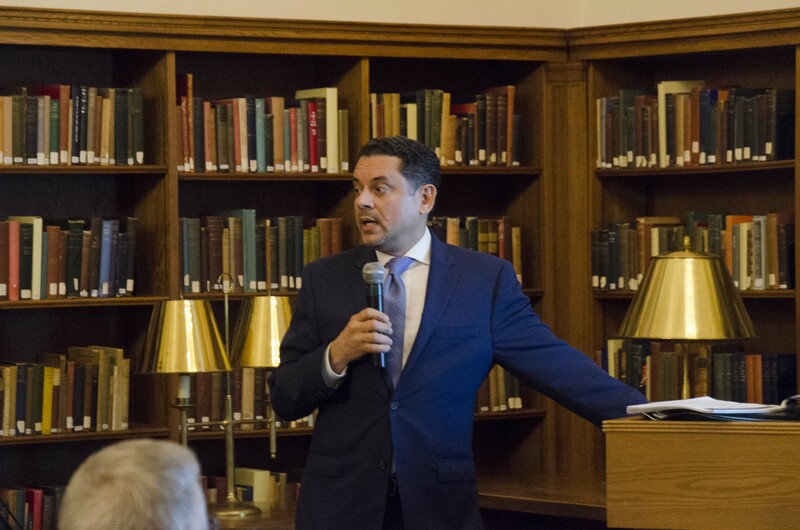 On Monday night, Olin Library held its annual Constitution Day lecture in the Smith Reading Room. The event was open to students, faculty, staff, and the general public in an effort to engage everyone in the greater Wesleyan-Middletown community. The Friends of the Wesleyan Library invited José Luis Morín to provide the lecture, which was entitled “The U.S. Constitution, Puerto Rico, and the Unfinished Business of Realizing Our Best Ideals.” Morín is a professor in the John Jay College of Criminal Justice at the City University of New York (CUNY), as well as chair of the school’s Latin American and Latinx Studies Department. His academic specialties include criminal justice, civil rights, Latin American studies, and human rights law. He is the recipient of the 2007 “El Award” for his contributions to the Latinx community and was named a Kellogg MSI Leadership Fellow in 2005. Morín began his lecture by articulating the importance of the U.S. Constitution in shaping our policies, particularly those that set a precedent for Puerto Rico’s function as an American territory. Morín believes this perception is often untrue, especially when examining the relationship between America and its foreign territories. He argues that people from Latin and Pacific countries have been seen as unworthy of autonomy since the very beginning. The American ideal of Manifest Destiny created a widespread belief that many former Spanish colonies should belong the United States, a belief which was intensified by the racial and cultural perceptions of “alien races” as inferior to Anglo-Saxons. They were seen as unruly mongrels, unable to manage their own affairs. Thus, in 1898, the U.S. took Puerto for itself, feeling justified because of the race of its inhabitants. Since Downes v. Bidwell has never been overturned, Congress’s plenary powers still imbue them with the right to decide Puerto Rico’s fate. Since the 1898 treaty, Congress has struggled to define the status of Puerto Ricans, asking what it means to be an American citizen living in an unincorporated territory. Puerto Ricans filed several cases to the Supreme Court regarding their desire for defined rights. Their argument is that if they’re citizens, why aren’t they getting rights? As Morín explained, it all comes back to Congress, who decided to award commonwealth status to Puerto Rico in order to diminish the perception of America as a colonial power. These restrictions on Puerto Rican citizenship have become extremely prevalent in their current economic state. Puerto Rico has a debt of at least $73 billion, a sum that is out of the realm of possibility in terms of repayment. As Puerto Rico cannot declare bankruptcy, they must repay all of their debt obligations themselves, obligations that, by law, must be resolved before the government can pay for Puerto Ricans’ basic needs like jobs, salaries, pensions, and schools. In the end, Puerto Rico is at mercy of Congress, for they have no authority over their own affairs. So what can be done? According to Morín, awareness is key. Just days after this lecture, Hurricane Maria devastated the island, further complicating many of the points raised by Morín. Those seeking to donate to the recovery effort can do so by visiting the websites of the Fondos Unidos de Puerto Rico, The Hurricane Maria Children’s Relief Fund, Caritas Puerto Rico, and Fundación Comunitaria de Puerto Rico. Erin Hussey can be reached at ehussey@wesleyan.edu or on Twitter as @e_riss.